I want to serve something a little whimsical this Easter. But, as I mentioned in the last post, we have certain menu items that are tradition. So to change things up, when I call my family to the table this year, I am going to start with an Amuse-Bouche. Amuse-Bouche (loosely translated) means “the chef’s surprise”. If you were served this in a restaurant, it would not be an item listed on the menu. The Amuse-Bouche is a bite sized hors d’oeuvre, provided as a gift from the chef, and it is meant to prepare you for the meal to come. It also, in my opinion, gives you an idea of the chef’s culinary point of view. What’s my point of view? Creating food that will provide my family with a lifetime of great memories, and that is what makes this the perfect addition to our table. My girls absolutely love quail eggs. I started buying them at Whole Foods, and since the first time I served them, they just could not get enough. My youngest thinks they are so cute, she likes to walk around holding them in the palm of her hand, as if she expects them to hatch. This year, the kids even want to dye little quail eggs for the Easter Bunny to find. In the picture above you see that I have placed the eggs in a baby nest. As adorable as this picture is, the real thing is even better. I know that these little jewels will bring a smile to everyone’s face. The recipe is so simple, that there really is no recipe (but I will give it to you anyway). Every time I make a deviled egg of any type people ask me for my secret. The secret is…don’t mess with them. The best deviled egg to me, is the simplest. PS: I got the baby nests at the Madison Flower Shop for 99 cents per nest. The grass is called “Tissue Turf” and is available at www.FancyFlours.com . Bring a small pan of water to a boil. Gently drop the quail eggs in the boiling water and cook for exactly 2 minutes. Remove the quail eggs from the water with a slotted spoon and let them cool completely. Once cooled, gently peel off the shell and split each egg in half lengthwise. With a butter knife, carefully remove the yolk of each egg to a bowl. Mix the mayonnaise and yolks together with a fork. Using a pastry bag, pipe the filling back into the egg halves. When ready to serve the eggs, line each nest with shredded raffia. 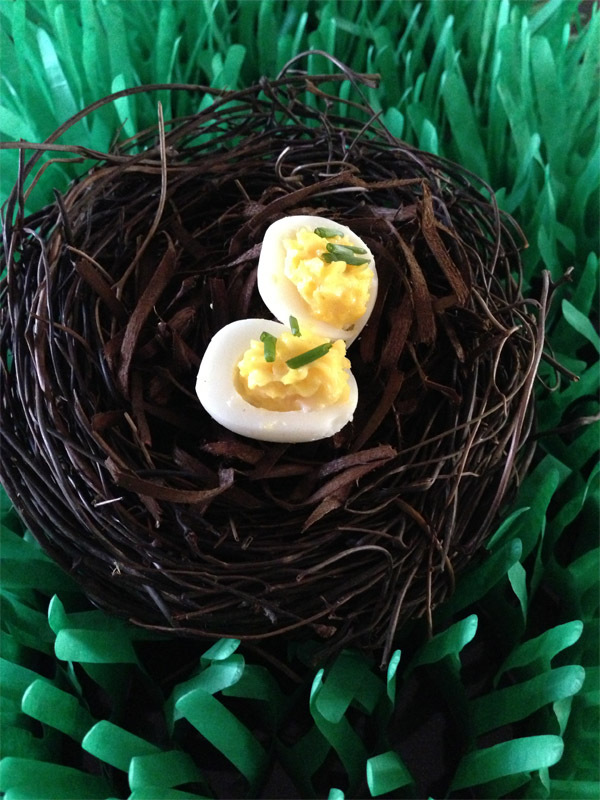 Sit two egg halves on the raffia, and place the entire nest on a plate. Repeat these steps for each guest you are serving. The Elegant Occasion Note: These eggs can be prepared 24 hours in advance, and stored in the refrigerator well-covered. Rhonda - I just love this idea, and how simple!! Can’t wait to see the faces of my guests! Thanks Roberta for another great idea! Le Creuset Giveaway by Page Hardware & Appliance Co. Wedding season is about to begin which means it is time to register for those all important home appliances. I could not live without my collection of Le Creuset. Lucky for all of us in Connecticut you can find Le Creuset right at Page Hardware & Appliance Co. in Guilford. Tomorrow Page Hardware is having a local wedding showcase (details below). In honor of the wedding showcase I teamed up with Page Hardware & Appliance Co. for your chance to win what every person and newlywed should have in their kitchen, together we are doing a Le Creuset giveaway! 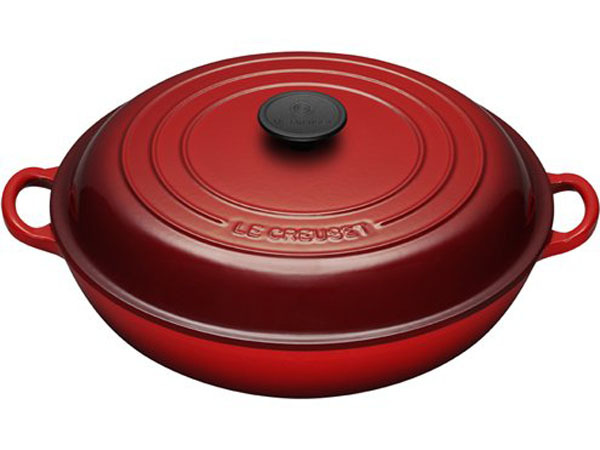 Here is your chance to win a beautiful 3.5 quart oval pot with a lid in Cherry Red from Le Creuset. Rules: Only one entry per person and must live in Connecticut. Stay tuned the winner will be announced on The Elegant Occasion facebook fan page on Saturday morning. This is an opportunity for couples to sample food, cake, and drinks while gathering inspiration for their special day from local vendors. Brides will leave with DIY project ideas and suggestions for unique touches to add to any wedding. Grooms can sample beer, plan the honeymoon, and learn about grilling, power tools, and home hardware. Couples can register to win prizes such as a Kitchenaid Stand Mixer or Oscillating Tool Kit. Couples will also receive a $25 Guilford Food Center gift card for making a registry appointment at the event! The event is free and every couple receives a gift bag filled with product samples from Page’s. Justine - I am an awful cook but trying :)As a newly wed I would love to make my husbands favorite braised ribs in this beautiful pot. Justin - I recently got into cooking and would love to win this pot to roast vegetables. Tanks for a great giveaway! Maureen - I have been dieing to add this pot to my collection. Great for making musscles. James - This is one that is missing from my collection. It would make the whole set complete and I would love to make lots of dishes in this. Felicia - These are the best pots! I would make my favorite roasted shallots. Yum! Dawn - I have been wanting this pot! I have a family recipe for cabbage and my grandmother said to use this pot for it. Margaret Very - Have wanted one of these dishes for years! Love to cook but don’t spend money on myself.I can think of hundreds of recipes that would benefit from being made in this dish.Maybe start with a stew for these last winter days? Hoping to be the winner. Doan Steel - Always wanted to try one and see if it made a difference. Love the idea of the Quail Eggs. Thanks for letting us in on the find! Amanda - I would try out my new learned recipes from my trip to China- fried rice and tofu. Excited to practice! Pamela Sweet - I would make braised short ribs.Perfect for a cold day! cassandra sweet - i just moved into my new home and I am hosting Easter dinner. This would be a great addition to my kitchen, not to mention help create an amazing holiday dinner. I am all about traditions. I love to continue traditions that were started generations ago in my family, and I get immense joy from creating new traditions with my little girls. So as I set about planning for the upcoming Easter holiday, I make notes for my menu. Yes, the menu is pretty much the same from year-to-year that is why it is called a tradition. But, making a list helps me keep organized and serves as a template for my grocery list and general to-do list. First I start out with breakfast. 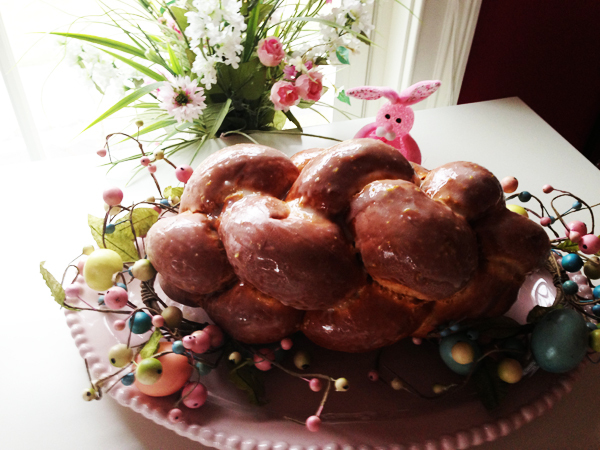 It has to be Easter Sweet Bread. My maternal grandmother, Felicia, used to live with us, and she would make this every Easter Saturday when I was a child. I would watch her knead the dough, roll it out, kneed again. The dough would rise overnight, and on Easter morning the house would be filled with the aromas of orange and lemon zests. How I loved the sweet, dense bread fresh out of the oven, just waiting to be slathered with butter. I started to think about exactly what it was I loved about that bread, and I realized it was not the bread itself; it was the tradition of standing by my grandmother’s side baking with her. It was how I would laugh when she would punch the dough down and say “Give it a good punch! Pretend it is someone you don’t like!” I realized that so much of my memories are tied to food, to meals, to laughter shared with those I love around the table. And I also realized that those are the kind of memories I want to make with my children. I set about changing the recipe for Easter bread after that. It is now light and delicious. My daughters look forward to it as much as I do, and just as I did all those years ago, they laugh when I tell them to give the dough a good punch. PS: Don’t worry about getting the bread to look perfect. If you don’t want to braid the bread, you can just form it into a loaf. It will not look as pretty, but it will taste just as good. Heat milk in a small saucepan over medium heat until an instant read thermometer registers between 110 and 115 degrees. Transfer milk to a measuring cup, and stir in one tablespoon of the sugar. Sprinkle the yeast over the milk and whisk to blend. Let the mixture sit until the it develops a bit of a foam…about five minutes. Whisk until smooth. In the bowl of an electric mixer combine the remaining five tablespoons of sugar, flour, salt, vanilla, and zests and mix with a dough hook. Slowly, add in the butter on piece at a time. Be sure to blend each piece of butter in completely before adding another piece. Once all the butter is incorporated mix on high speed until the dough is silky. This process takes about five to six minutes. Melt one tablespoon of butter and brush some on the inside of a large bowl. Transfer the dough from the mixer into the buttered bowl and brush the top of the dough with remaining melted butter. Cover with plastic wrap and let the dough rise for two hours. Line a cookie sheet with parchment paper. Punch down the dough, and then divide into three equal pieces and form a ball out of each piece. With lightly floured hands, roll and stretch each ball into a rope about 14 inches long. Arrange the ropes side by side lengthwise on the cookie sheet. Braid the dough and pinch the ends together. Loosely cover the entire cookie sheet with a damp kitchen towel and let the bread rise for a minimum of two hours or overnight (I let it rise overnight, so that my family can wake up to the smell of this bread on Easter morning). When ready to bake the break, whisk an egg with one tablespoon of water in a small bowl. Brush the egg wash all over the break. Bake at 375 degrees until the bread is golden brown (about 25-30 minutes). Transfer the bread to a rack. If you are going to frost the bread as pictured above, let the bread cool for 10 minutes, and then brush the glaze over the entire loaf. This bread is wonderful served warm with butter! Whisk together and brush on the warm bread. The Elegant Occasion Note: If you do not want to braid the dough, you can shape the dough into two equal size balls (instead of three) and let rise as directed. You will then have two round loaves of bread to bake. Jess - My best friend and I are making this bread for Easter – we cant wait! In my house, Sunday dinners are sacred! Growing up in a very traditional Italian family in upstate New York, Sunday dinners were always filled with relatives. My aunts, uncles and cousins would gather around the table, and everyone would shout over each other trying to be heard. My father would have big jugs of his homemade wine on the table and he would make sure the glasses were always filled for the grown-ups, and we would eat and celebrate being together for hours. I guess some people would consider it noisy and chaotic, but I considered it to be the best day of the week. Now, I am forty-six, married with three daughters, and Sundays are still the best day of the week. We don’t have any extended family living close by, so our dinners are quieter than the ones I had growing up. But they are even more special, because now I am sharing this with my daughters, passing on the traditions of the past. Every Sunday morning I get up early and start my sauce. The smells of garlic, basil and olive oil fill the kitchen. I brown sausage and pork in the oil, adding another layer of flavor to the base of my sauce. I mix ground veal, beef and pork with spices and show my little girl how to roll the perfect meatball. And I puree plum tomatoes until they are almost orange in color. When I add the tomatoes to the oil, garlic, sausage and pork, the sauce bubbles, and I know it is ready for the last ingredient; parmesan cheese. The sauce simmers on the stove, and all day the anticipation builds for our Sunday meal. My daughters ask “when is dinner?” before they have even had lunch, just the way I did as a child, and it brings a smile to my face. The time has come to gather around our Sunday table. Sunday dinner is always eaten in our dining room; it is too special of a meal for the kitchen. My husband fills our two glasses with wine, and I look around the table at my family, and see the smiles on my girls’ faces. At that moment I know that regardless of where life takes them as adults, regardless of where they live or what careers they choose, this will be a tradition they continue when they have families, and it makes my heart fill with joy. I make my sauce and countless other stews, soups, and much more in a Le Creuset Dutch Oven…get yours at Page Hardware and Appliance Company. Heat oil in a large pot and add garlic, basil, parsley and sausage. Cover the pan and let the sausage brown (about 5 minutes). Turn the sausage over and continue to brown, moving the garlic cloves around the pan so they become golden but do not burn. This whole process will take about 7-8 minutes. While the sausage caramelizes, puree the tomatoes in a blender. Add the tomatoes to the pan, along with the grated cheese, garlic salt and pepper. Stir to combine and let the sauce gently simmer on a low heat (covered) for a minimum of 3 hours, but up to 5 hours. Remember to stir the sauce every 30 minutes to ensure it is not sticking to the bottom of the pan. While the sauce is cooking, make the meatballs. Mix everything together using your hands, and working quickly. Roll the meat into balls and place them on a parchment lined baking sheet. Drizzle the meatballs with olive oil and place in a 375 degree oven for 10-12 minutes, until they are golden brown. When the meatballs are done, put them directly into the simmering sauce. The Elegant Occasion Note: The meatballs only need to cook in the sauce for 30 minutes. However, if you are making the meatballs early in the day, they can cook in the sauce for as long as you wish. The longer they cook together with the sauce and sausage, the more flavorful your sauce will be. This recipe makes enough sauce for up to three pounds of pasta with extra sauce on the side. deb - This was amazing!!! I made the sauce and meatballs for my guests on Sunday. It was a huge hit! My entire house had the aroma of a great Italian restaurant! What a wonderful Sunday tradition for your family. Thanks so much!!! I can’t wait to try the green bean and potato pesto – It’s next!! Jess - I made this recipe and love it! It has become a go to in my home on Sundays and other family get together’s. We went to NY for my husband’s birthday last spring and had lunch at a great little Italian Restaurant near the Pierre. I ordered a dish with house made pasta and a green bean and potato pesto. It was fabulous! The dish was perfect for springtime, as the vibrancy of the sauce jumped off the plate. I knew without a doubt that I was going to try to replicate this dish. We got back from NY and I went on a mission to get it just right. The pasta is not home made, but the sauce is incredible. This dish is the perfect entrée for an alfresco meal. Peel and dice one medium potato. Fill a small sauce pan with water and drop potatoes into the pot. Bring the potatoes to a boil. Drain the potatoes and let cool. Trim the ends of the green beans. Place beans in a microwaveable bowl and add two tablespoons of water. Cover tightly and cook in the microwave for 3-4 minutes until very tender. In a food processor, combine garlic, basil, potatoes, green beans and lemon zest until blended. Slowly stream in the olive oil and combine again. Pour pesto into a bow, and stir in parmesan cheese, salt and pepper. The Elegant Occasion Note: Always use good quality parmesan cheese! The pesto sauce is a great topping for sandwiches and roasted tomato and eggplant napoleons! Fill a pan with 6 quarts of water and bring to a boil over high heat. Add one teaspoon of salt to the boiling water. Drop in one pound of spaghetti and let cook until al dente’ (about 9 minutes). Drain pasta, reserving a ½ cup of the cooking liquid. Place pasta in serving bowl. Pour pesto over spaghetti, and add the reserved cooking liquid. Grate parmesan cheese over the top and garnish with fresh basil leaves. The Elegant Occasion Note: The pesto can be made in frozen in an airtight container for one month. Felicia - This looks so unusual and delicious! I bought all of the ingredients and plan on trying it out this week. It is nice to see a pesto without nuts. My nut allergic son will be thrilled to finally be able to give it a try. Can the pesto be made ahead of time? admin - Hi Felicia, thanks so much for commenting. I too, have a child with a peanut allergy, and I know how frustrating it can be for everyone. This pesto has so much texture with the green beans and potatoes that you will not miss the nuts…that is what I love about it. I make the pesto in advance and store it in the refrigerator, then toss it into the hot pasta when ready serve. It is also a great topping on sandwiches or pizza!